Nothing else can put a smile on face than a classic cupcake. From strussel toppings to creamy frostings, to fruit infusions and favors of all varieties, Foodal has your favorite recipe below. Had enough of brunch and brinner? Move on to the dessert (or bressert!) course. 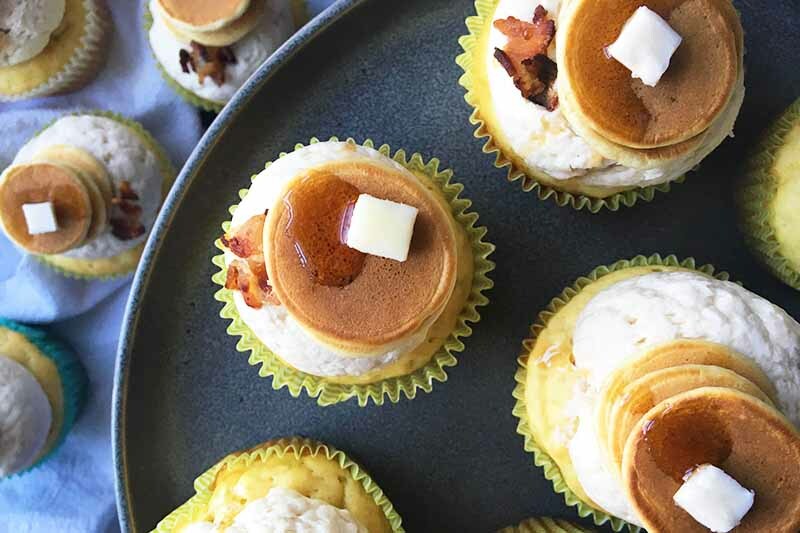 Bake these sweet and fluffy pancake cupcakes finished with maple syrup frosting and crumbled bacon pieces. And have fun with the garnishes, like with our mini pancake and butter toppings. Learn how to make this fun recipe now on Foodal. 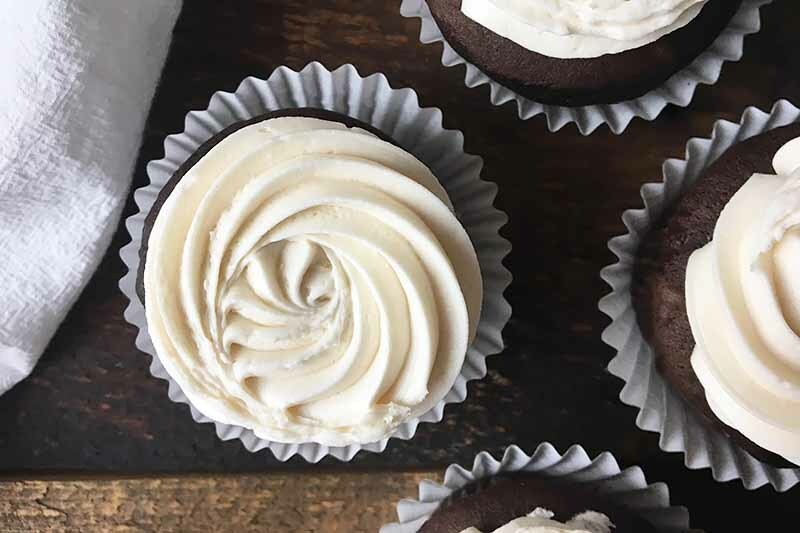 Need a tasty icing to spread on top of a dairy-free cake or cupcakes? 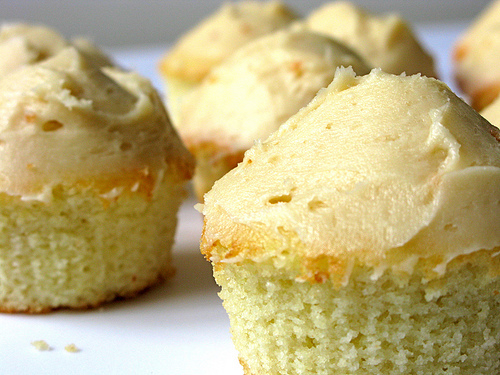 Make our 5-ingredient sweet and fluffy vegan vanilla frosting to complete your dessert. It’s like a traditional buttercream with classic flavors of vanilla, powdered sugar, and the perfect pinch of salt. 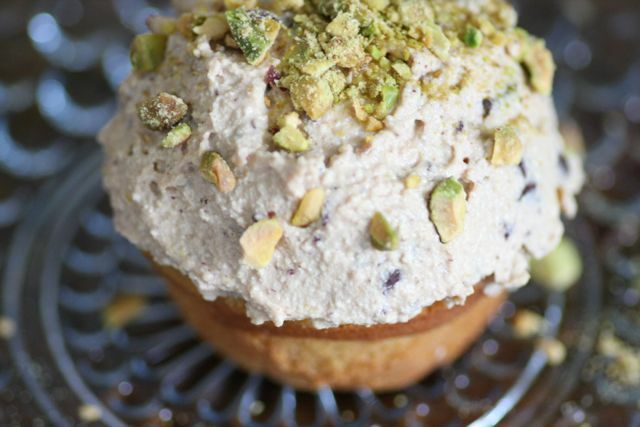 Enjoy this lactose-free recipe now on Foodal. Do you love the pairing fruit and chocolate together? 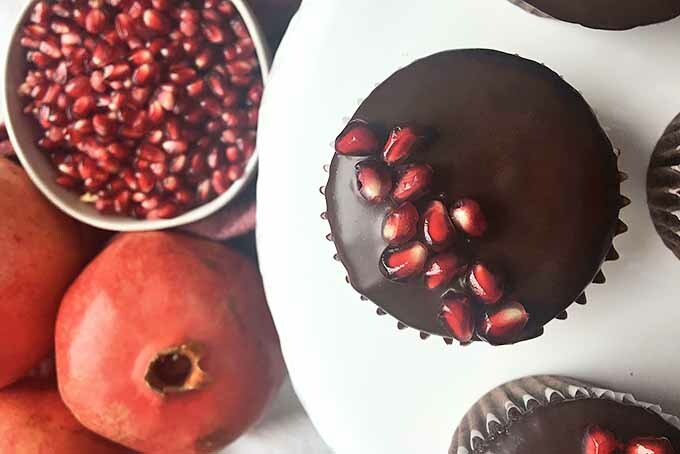 Our pomegranate chocolate cupcakes are a flawless combo of rich chocolate and subtle fruit flavors. Topped with a fudgy layer of ganache and garnished with crunchy pomegranate seeds, there’s no denying you’ll want a second helping. Get our recipe now on Foodal. If you want to get your chocolate fix, and enjoy a bit of booze at the same time, make this dessert. 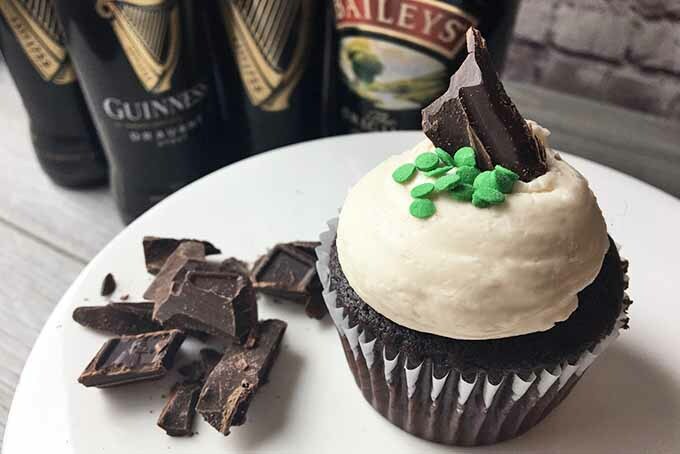 Our Guinness stout chocolate cupcakes topped with Baileys buttercream frosting will give you a luscious sweet treat with flavors you’ll love. So raise a pint, and spill it in some batter. Get the recipe now on Foodal. Don’t let your strict diet get in the way of enjoying the dessert course! 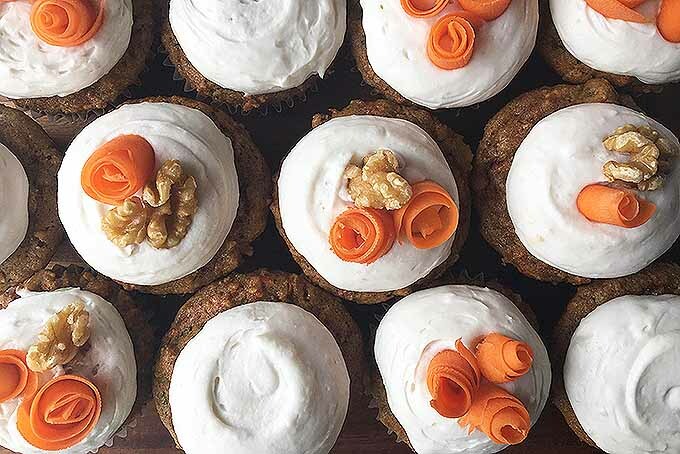 Foodal’s recipe for paleo carrot cake cupcakes with coconut whipped cream is gluten-free, dairy-free, and low in sugar. You’ll love the thick and fluffy icing and spicy almond flour cake base packed with carrots, nuts, and raisins. Try the recipe today! The cupcakes we made last weekend for a jam-packed family visit. 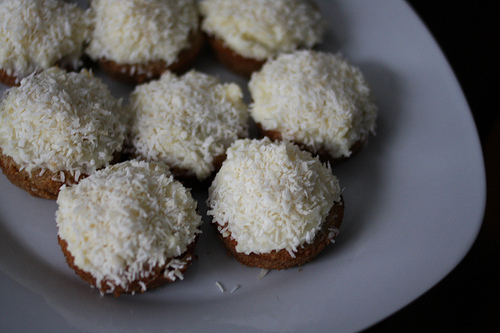 HaThese coconut-packed cupcakes made with a sugar subsitute are slathered with a tasty cream cheese frosting. 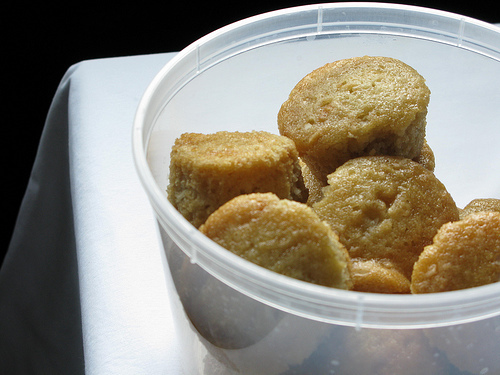 Try a batch now using our recipe on Foodal. With a dense, vanilla-flavored base that resembles a muffin or cornbread in texture, these cupcakes are topped by a slippery buttery salted frosting.